What happens when a kid chases his dream of playing baseball . . . and he’s a Zombie? 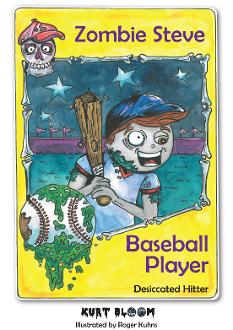 Zombie Steve has to figure out how to overcome the obstacles in his path and reach his goal of playing baseball on a team . . . or, in his case, as close as he can get to one without everyone running away. Join Steve, Stacy, and Dave in their adventure as they help each other achieve their dreams!